The Darzis derived their name from the Persian word 'to sew' or darzan. 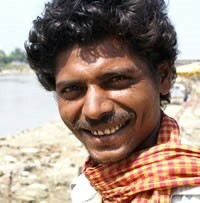 Sometimes the Darzi are known by the name Darji or Khayyat in India where most of their community live. An Indian legend says that the god Parasurama was pursuing two brothers to destroy them and they found haven in a temple. A priest hid them and gave one brother the task of sewing dresses and the other dyeing cloth. The Darzi are said to be the decendents of the first brother and therefore, Darzis are most commonly tailors. 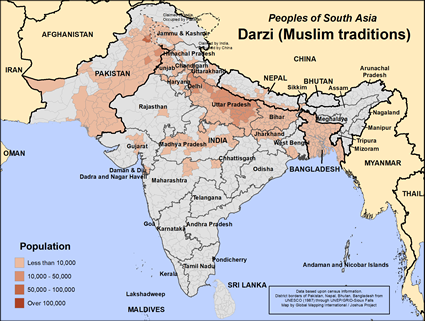 There are more than 3.5 million Darzis in all and about one third of those are Muslims, the rest are Hindus. A majority of the Darzi Muslim people live in the central Terai region of Nepal and speak Nepali and Urdu. They often occupy a middle ground of social status. As tailors they enjoy close relations with other Muslim tradesmen. The Darzis are not vegetarian but tend to avoid beef. As a community they prefer adult marriages and offer children's inheritance privileges to both sons and daughters. Men will sometimes wear a kurtapyjama and woman a salwar-kameez. Because of the Darzi's openness to business and upward social status, this is a great opportunity to offer outside assistance to educational or other development projects. Pray that the church can love the Darzi people like God does, enough to offer micro loans and other development programs as a means to sharing the gospel among them. View Darzi (Muslim traditions) in all countries.